According to 6Wresearch, UAE Building Automation Control Systems Market revenues are projected to grow at a CAGR of 7.5% during 2018-24. UAE is set to host a mega event, "World Expo 2020", which would act as a major driver for the growth of Building Automation Control Systems market. Intensive infrastructure development including malls, hotels, tourist centric places, shopping centers and world parks are underway to accommodate high tourist footfall during the event. These factors would spur the growth of building automation systems market during 2018-20. According to Ravi Bhandari, Assistant Manager, Research and Consulting, 6Wresearch, "HVAC systems in building automation acquired the largest revenue share due to growing demand for automatic cooling and heating devices inside buildings to regulate the temperature. Additionally, energy management devices such as smart meters would exhibit highest growth during the forecast period on account of government initiatives towards the concept of energy efficient solutions and regulation of electricity usage in various areas." According to Priya Sharma, Research Associate, Research and Consulting, 6Wresearch, "UAE hospitality sector is expected to receive huge investment on account of World Expo 2020. Further, to attract more tourists every year, UAE government is planning to construct more number of tourist centric places which would help the hospitality sector to grow even more swiftly and would subsequently affect the market growth of building automation systems." "Under the country's development plan - UAE Vision 2021, the commercial, industrial and transportation sectors would also experience rise in capital investment. Hence, increasing construction activities in these sectors would help the building automation systems market to prosper during the forecast period," Priya further added. Some of the key players in UAE Building Automation Systems Market include- Schneider Electric, Siemens, Honeywell International, Johnson Controls International, ABB Automation, Crestron Electronics, Naffco, Carel Industries, Vacker and Greentec Automation. 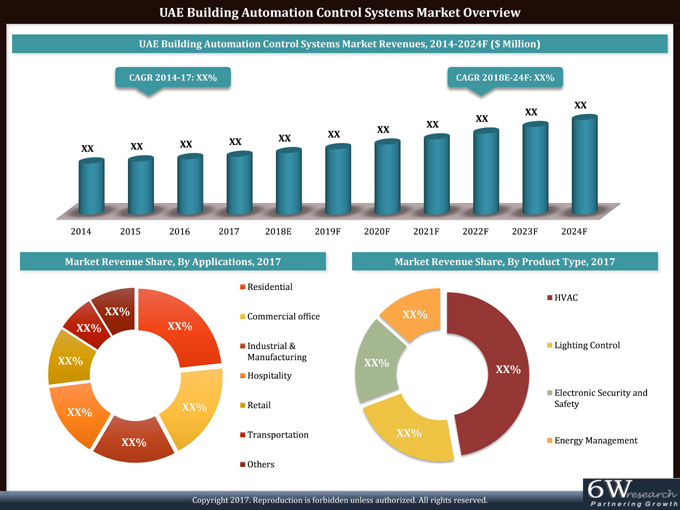 "UAE Building Automation Control Systems Market (2018-2024)" provides in-depth analysis with 63 figures and 14 tables covered in more than 140 pages. The report estimates and forecast the overall building automation systems market by revenues, product type, regions and applications such as residential, commercial office, hospitality and others. The report provides an unbiased and detailed analysis of the on-going trends, opportunities/high growth areas and market drivers which would help the stakeholders to device and align their market strategies according to the current and future market dynamics.